Although they are among the most robust and hardwearing window dressing options available, plantation shutters still require maintenance and upkeep in order to work effectively and continue to provide the stylish look that they offer to homes and shops. 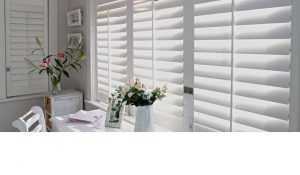 So what are some of the ways in which you can keep your plantation shutters clean and in good condition? Without taking drastic action, there are a few simple ways in which you can keep your plantation shutters clean. Due to the nature of their design, with horizontal slats that can be opened and closed, regular upkeep simply takes the form of running a cloth or duster over the louvres, removing any dirt. Light disinfectants and a slightly damp cloth should be enough to remove any tougher stains. Vacuuming the slats using the soft brush attachment is also an option, tilting the louvres one way and then the other to vacuum along each side, although care should be taken when using this method. How you go about cleaning your plantation shutters depends largely on what they are made of. For real wood units, avoid using water-based cleaning techniques, as this can negatively affect the material and cause it to warp. Alternatively, use wood polish sprayed on to a cloth, and clean the slats rigorously yet carefully, using a toothbrush for any hard-to-reach corners and crevices. For faux wood shutters, often uPVC, water can be used alongside all-purpose soap for detailed cleaning. Mix mild detergent with warm water, and wash the slats using a cloth. Don’t forget to use fresh water to rinse the soap suds away afterwards as well as drying thoroughly with a towel to avoid marks and spotting. However, if the plantation shutters’ location causes them to become extra greasy or dirty, such as close to cooking equipment or on an external shop front, a stronger detergent solution will be needed – along with a bit more elbow grease! External shutters, such as on shop fronts, will by nature be more hardwearing. A hose pipe with sufficient water pressure will help to remove any loose dirt, while washing using stronger detergents (as with faux wood blinds) will generally be a safe and effective method. If the slats are proving either stiff or loose when opened or closed, don’t panic. Simply take a screwdriver (usually a Phillips head), and tighten or loosen each louvre individually using the tension screws on each side. Scratches in the paintwork can easily be covered by additional paint. Be sure to locate the exact colour, and use a soft brush to apply the paint, so as not to cause further damage. Just because plantation shutters provide a heavier duty window dressing option than most blinds or curtains, they can still suffer from misuse if not treated correctly. Take care when opening and closing, and always be gentle when twisting the rod that controls the slats. As plantation shutters open outwards instead of upwards, ensure that there is a means of attaching the opened shutters to the wall to prevent them from flapping about and causing damage. Gemini Blinds provide an extensive range of plantation shutters to customers throughout the North West, providing a robust and attractive window dressing option that can suit homes and shop fronts alike. Get in touch with Gemini Blinds today to find out more.